Have always been a great fan of Susan George and have seen most of her films and this particular picture I discovered on E Bay and it was a great find to enjoy the great acting of both Susan George and Telly Savalvas. 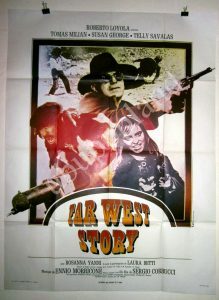 Of course this is a Spagettii Western and a comedy but it is not your usual run of the mill type of film. There is plenty of vulgarity and romantic scenes and a rough relationship between Jed, (Tom Milian) and Sonny, (Susan George). Jed is an very crude man who is a robber and he meets up with Sonny who seems to take a liking to him even though he treats her very poorly. Jed and Sonny become something like a Bonny & Clyde team who go around stealing and robbing everyone they come in contact with. Sheriff Franciscus, (Telly Savalvas) is out to get these two people and even though he becomes blind still manages to try and hunt down these two criminals. This is a great film and if you get a chance, don’t miss this great Susan George Film.